Lab suppliers working to meet researchers and learn more about the laboratory equipment sales market in Georgia may be interested in Biotechnology Calendar, Inc.’s U Georgia life science marketing event. The Athens BioResearch Product Faire™ Event at the University of Georgia will be held on February 26th, 2014. We expect at least 150 attendees based on last year’s attendance statistics. Biotechnology Calendar, Inc. life science marketing events are attractive to researchers, purchasing agents and lab managers because we provide a comfortable space where they can discuss their latest research projects and lab supply needs during a time they have specifically taken out of the day to think about how best to stock their labs. Biotechnology Calendar, Inc. life science marketing events are catered with delicious lunches that encourage researchers to socialize over a meal and stay until the end of each event. Our events are also a great way to increase your company’s laboratory equipment sales because researchers like being able to match a face with the company they’re doing business with. By discussing each attendee’s individual research process, you can help researchers find the missing puzzle piece that saves them time, money or waste. Not only that, but forming a connection with researchers ensures that they will know who to talk to if their lab supply needs change. In 2012, the NIH awarded the University of Georgia $39.4 million. This research funding was distributed among a number of life science departments at the University of Georgia. The NSF gave the University of Georgia $1.2 million in research funding in 2012, while the school’s budget was $1.32 billion that same year. For more funding information on the University of Georgia, please read our blog articles University of Georgia Life Science Update on NIH Funding and University of Georgia Receives $3M for Bioenergy Research. The University of Georgia is a growing research powerhouse. If you are a lab supplier and you would like to meet researchers or learn more about the laboratory equipment sales market at the University of Georgia, Biotechnology Calendar, Inc. invites you to attend our Athens BioResearch Product Faire™ Event on February 26th, 2014. 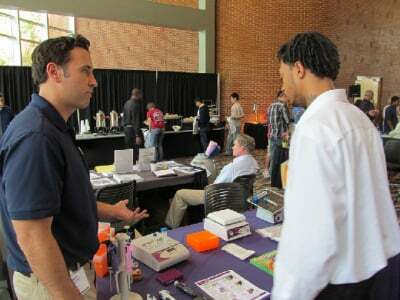 Last year, the Athens BioResearch Product Faire™ Event attracted 153 visitors. Of those who came, 30 were purchasing agents, professors and post docs, and 29 were lab managers. The visitors came from 27 different research buildings and 28 departments around campus. Biotechnology Calendar, Inc. is a full-service science research marketing and events-planning company that organizes life science marketing events at top research institutions across the country. If you would like to meet researchers or are interested in learning about a laboratory equipment sales market closer to home, we encourage you to view our 2013 calendar of events and 2014 calendar of events. For more University of Georgia life science funding statistics, or to learn more about the Athens BioResearch Product Faire™ Event, click on the button below.